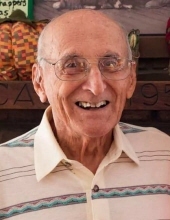 Celebrating the life of Louis Ottolini, Jr.
Obituary for Louis Ottolini, Jr.
Louis Ottolini, Jr. 87 of Herrin, passed away 5:00 a.m. Wednesday, August 29, 2018 at Herrin Hospital. Louis worked for Norge Industries in Herrin for several years and he owned and operated Ottolini Appliance Repair in Herrin for 46 years. Louis was a member of Our Lady of Mt. Carmel Catholic Church in Herrin; Knights of Columbus Council # 2164 in Herrin, was a former member of the Herrin Area Ducks Unlimited and proudly served his country in the U. S. Army. He was a dedicated blood donor and just received his commemorative pin for his 18th gallon. He enjoyed fishing, but his true passion was duck hunting. Louis was very dedicated to his family and will be dearly missed by many. He was a very unique man, and will forever live through the stories of his kindheartedness, wisdom and wit. Louis was born March 15, 1931 in Herrin, IL to Louis, Sr. and Bambina (Puricelli) Ottolini. Louis was united in marriage with Barbara Ann Anderson on November 9, 1954 in Herrin, IL. Surviving are his wife of almost 64 years, Barbara Ottolini of Herrin; daughters, Cyd Ottolini of Energy, Luanne Ottolini Ponder of Energy. He was preceded in death by his parents; two sisters, Angela Jones, Bessie Ottolini and a brother, Johnny Ottolini. A Memorial Mass will be held 11:00 a.m. Thursday, September 6, 2018 at Our Lady of Mt. Carmel Catholic Church in Herrin with Monsignor Ken Schaefer officiating. Visitation will be from 5:00 p.m. until 8:00 p.m. Wednesday, September 5, 2018 at Meredith-Waddell Funeral Home in Herrin and from 10:00 a.m. until 11:00 a.m. Thursday in the Gathering Space at Our Lady of Mt. Carmel Catholic Church in Herrin. Interment will be at a later date in San Carlo Cemetery in Herrin. Memorial donations are the suggested form of remembrance and may be made to OLMC New School Fund. Envelopes will be available at the funeral home. To send flowers or a remembrance gift to the family of Louis Ottolini, Jr., please visit our Tribute Store. "Email Address" would like to share the life celebration of Louis Ottolini, Jr.. Click on the "link" to go to share a favorite memory or leave a condolence message for the family.